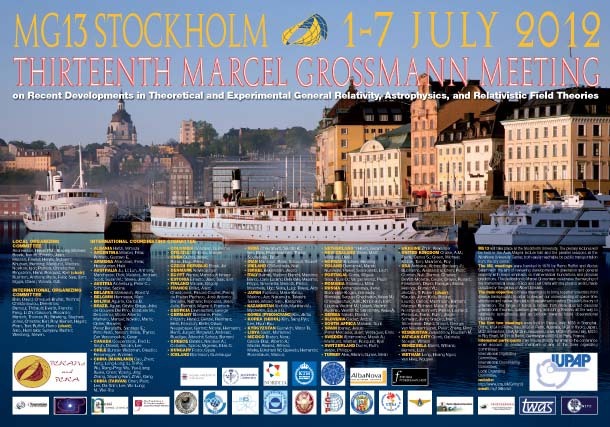 The Thirteenth Marcel Grossmann Meeting on Recent Developments in Theoretical and Experimental General Relativity, Gravitation, and Relativistic Field Theory will take place at the Stockholm University in Stockholm, Sweden July 1 - 7, 2012. Preregistration will take place Sunday, July 1, and the official opening of the meeting Monday morning, July 2. During the six day conference a wide variety of topics will be discussed in the morning plenary sessions beginning with mathematical topics on Monday, quantum aspects of gravity on Tuesday, precision tests of general relativity on Wednesday, relativistic astrophysics on Thursday, cosmology and astroparticle physics on Friday and the latest scientific news and the history of physics Saturday. There will be five plenary lectures each morning and up to twenty parallel sessions in the four weekday afternoons excluding Wednesday, which is left free for a trip and the evening conference banquet. "To secure IUPAP sponsorship, the organizers have provided assurance that MG13 will be conducted in accordance with IUPAP principles as stated in the IUPAP resolution passed by the General Assembly in 2008. In particular, no bona fide scientist will be excluded from participation on the grounds of national origin, nationality, or political considerations unrelated to science." As more information becomes available, it will be posted on this web site, now in its preliminary phase.